The LakesandHills.com website is a great place to showcase your business if you are located in the Highland Lakes region of the Texas Hill Country. We are also open to advertising from businesses who wish to target the traveling public. 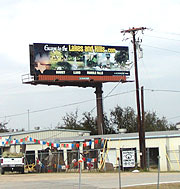 This website was founded in 2003 as the bounce back point for (33) Lamar Outdoor Advertising billboards situated on major highways in prime locations around Texas, Oklahoma and Arkansas. Highway 71 in Spicewood, Tx. annually for over 2 years. 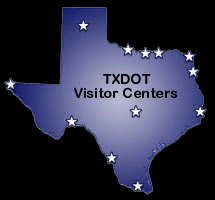 FREE BUSINESS LISTING - Any qualified tourism attraction or tourism related business within the Highland Lakes and the Texas Hill Country region, is entitled to a free listing on this website. To submit a listing go to our Listing Form. Free listings are placed at the discretion of the website owner in the appropriate catagory(s) within the site. A free listing includes the name, address, phone number and description (maximum 256 characters) of the business, but does not include any e-mail addresses or links to the business' website. FEATURED LISTINGS - A Featured Listing is an upgrade from a Free Business Listing and will include the business name, address, contact information, hours of operations, a description of the business (maximum of 256 characters) and a link to the advertisers website. 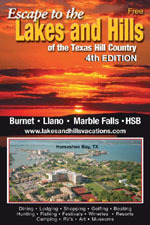 LakesAndHills.com is privately owned and operated as an Internet On-line Tourism Resource Guide for the Highland Lakes and the Central Texas Hill Country. The owner has certain policies governing the use of space on this website. For more information please contact Lakes and Hills Publications.